In some parts of China almost one in ten children have goitre (enlarged thyroid glands) due to excess levels of iodine added to drinking water and salt, new research shows. Iodine supplementation of salt was introduced in China in the 1990s to combat iodine deficiency which has been a long term problem i some areas. However, the supplementation may have gone too far say researchers from Tongji University, Shanghai. They examined iodine levels in almost 1600 schoolchildren 8 to 10 y old from the 16 counties of China. They found that in each area, the median urinary iodine of schoolchildren was nearly or above 200 μg/L, which confirmed the effectiveness of the iodisation strategy. 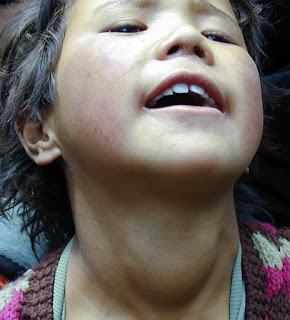 However, in areas with an iodine content higher than 150 μg/L in the drinking water, schoolchildren had more than adequate or excessive iodine intake, which was associated with an 8% prevalence of goitre. "Therefore, it is important to adjust the strategy of universal salt iodisation control in China," the researchers say.